You are here: Homepage » Articles Index » What is a Party Wall? 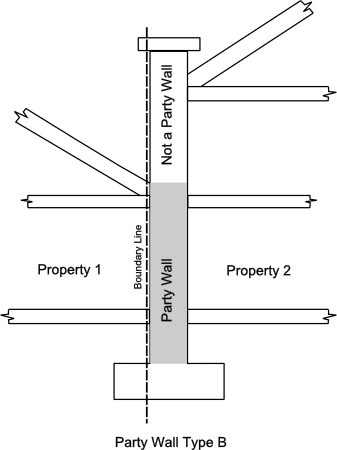 In simple terms a party wall divides the buildings of two owners with the boundary between ownerships usually, but not always, positioned at the centre of the wall. A wall that stands astride the boundary of land belonging to two (or more) different owners. Examples include walls separating terraced or semi-detached houses or walls that form the boundary between two gardens, known as a “party fence wall” (see more detailed description below). A wall that stands wholly on one owner’s land, but is used by two (or more) owners to separate their buildings. Examples include where one neighbour has a structure that leans against a wall that is owned by the other neighbour. Only the part of the wall that is enclosed by the lean-to is a Party Wall. The Act also uses the expression "party structure", as in “Party Structure Notice”. As well as the party walls described above this term encompasses dividing structures such as floors or other partitions. It is rare that structures of this type are the subject of a Party Wall Agreement. 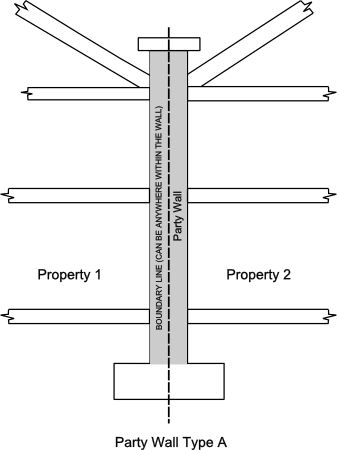 A "party fence wall" is not part of a building. It stands astride the boundary line between lands of different owners and is used to separate those lands. Wooden fences, or even fences with concrete posts, are not party fence walls. If you are located within the London M25 area you can contact the authors of this article, the party walls team at Peter Barry Chartered Surveyors, on 020 7183 2578 or by email and receive up to 20 mins free advice on the subject of Party Walls and other party wall related matters.